103 min. Augusta Films/American Masters. Director: Nancy Buirski. Cast: Sidney Lumet. In the preface to his book Making Movies, the great director Sidney Lumet wrote, "I'll try to tell you as best as I can how movies are made. It's a complex technical and emotional process. It's art. It's commerce. It's heartbreaking and it's fun. It's a great way to live." 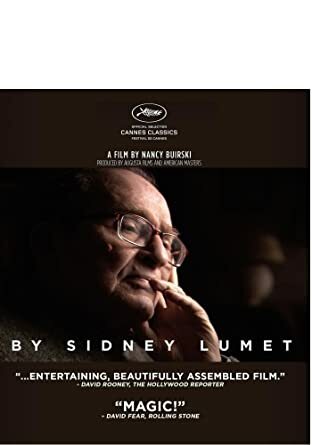 The fascination, and amusement and pleasure implicit in Lumet's words are written on his face throughout by Sidney Lumet, a documentary film by Nancy Buirski. Well established as a Pulitzer Prize-winning photo editor of The New York Times and documentary filmmaker (her The Loving Story provided the inspiration for Jeff Nichols' Loving, on which she is credited as producer), Buirski here takes on the task of giving shape to heretofore unseen 2008 interview footage of Lumet shot and produced by Daniel Anker and Thane Rosenbaum. She does so by assembling the footage around clips from Lumet's films and other relevant archival materials (photographs, B-roll from Lumet's film Dog Day Afternoon, clips from Lumet's other life as a child actor). Since the interview is a good one but perhaps not all that penetrating or comprehensive, Buirski has her work cut out for her in making a film out of it. She does this partly by taking a biographical tack to exploring Lumet as an artist and partly by rhyming Lumet films to suggest his thematic preoccupations (of one key theme, Lumet remarks, "Everything conspires to crush your individuality"). Around Lumet's comments, Buirski juxtaposes clips of Long Day's Journey Into Night and Before the Devil Knows You're Dead (family), The Verdict and 12 Angry Men (justice), Fail-Safe and The Hill (questioning authority, in this case the order of the military chain of command). In opposition to the notion that his eclectic output never coalesced around one, Lumet also identifies a central thematic concern of his work, which I won't spoil here. When I think of Lumet, it's not in terms of a theme, but rather his gift for capturing the textures of New York City ("I'm a city rat," he says in the film) and its institutions (100 Centre Street needs a Blu-ray revival, stat), and its characters. Lumet also expounds here on childhood poverty; coming up in the Yiddish theater, Broadway, and live TV; getting kicked out of the Actors Studio and finding himself as a director; and the moral dimension of his movies ("It's an unconscious choice. I don't pay any attention to it"). Lumet died three years after this interview footage was shot; cineastes have been missing him ever since. Like Noah Baumbach and Jake Paltrow's De Palma (also released in 2016), by Sidney Lumet has one undeniable result: it instills a fervent wish to watch the director's entire output from beginning to end, revisiting his classic films (to name-check one I haven't mentioned, Network) and discovering the ones one hasn't seen. Sound comes in Dolby Digital 2.0, and it's more than adequate for the film's humble aural demands. Better yet, subtitles have been provided for the deaf and hard of hearing. A nice of set of bonus features accompanies the feature. Bonus Interview Footage comprises "12 Angry Men Backdrop" (3:52, HD), "Racism and 12 Angry Men" (1:20, HD), "Academy Awards Hits and Flops, Part 1" (2:54, HD), "Academy Awards Hits and Flops, Part 2" (2:41, HD), "Live Television" (3:19, HD), "Long Day's Journey Into Night" (1:36, HD), "Margaret Booth" (5:23, HD), "The Pawnbroker" (3:04, HD), and "The Blacklist and Paying Writers" (5:09, HD). "An Extended Interview with Treat Williams" (11:26, HD) touches on character and themes of Prince of the City but mostly allows Williams to comment on Lumet's process and character, including his knowledge of New York. A "Trailer" (2:01, HD) for by Sidney Lumet rounds out the disc. All site content © 2000-2019 Peter Canavese. Page generated at 04/18/2019 02:01:17AM.